Our friends at SwitchLife.org, Josh & Sarah are hosting an art show & skateboard contest at Guapo Skateboards on October 6 from 6pm until 10pm. 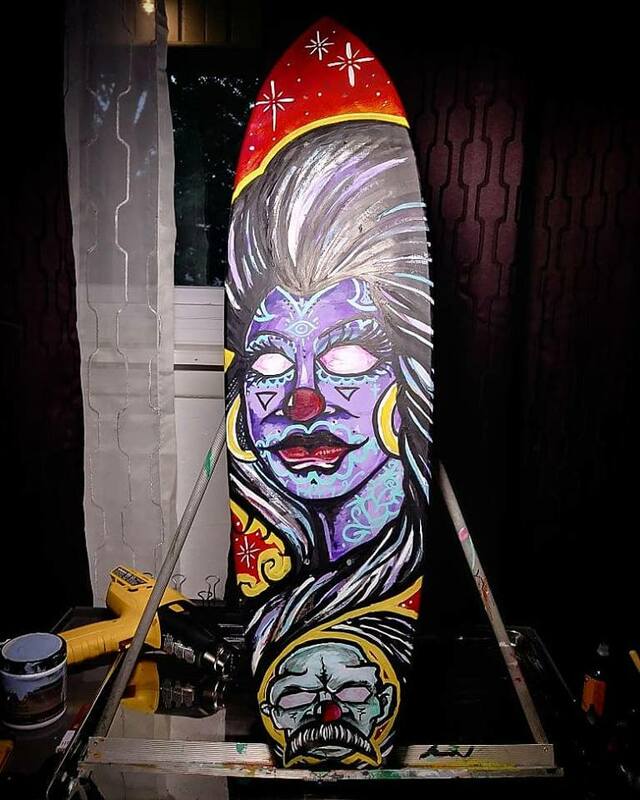 The event will feature skateboard themed art from over 20 local DFW area artists, as well as a Junior Best Trick, Open Bowl Jam and Open Street Best Trick contest. The full details of the event are available on their Facebook page. All are welcome to attend. SwitchLife provides free skateboard lessons to at risk kids, and the art show is a fundraiser to support ongoing programming. Organizations like The Family Place and Hope Kids have partnered with SwitchLife to provide skateboard lessons for kids in their programs. Read our full profile of SwitchLife HERE. The Dallas skateboard community is an extremely active community with a regular calendar of events. Guapo Skateboards recently opened the Texas Skateboard Museum. The visionary collector behind the Texas Skateboard Museum, Al Coker recently highlighted the graphical history of skateboarding on his Instagram account. The “Dallas Dames” are hosting a Skateboard Jam at 4DWN on October 20th. More information to follow on their event. While you are anxiously awaiting the SwitchLife Art Show Fundraiser, check out some of the art work you can buy at the event. The highest level amateur skate contest in the world is called the Tampa Am, which features 200+ of the best amateur skaters from around the world. Winners of the contest have gone on to amazing professional skating careers. To help grow the DFW skate community, many area skateshops and skate brands got together and hosted a contest called King of Guapo (#kingofguapo), and sponsored a prize to send the winner to November 2017's Tampa Am contest. 2017's King of Guapo was Marshall Stinson, 19. We reached out to Marshall to hear about his skating and experience at the Skatepark of Tampa. SP4D: We saw you win the King of Guapo contest and killin’ it at the DFW skateparks on Instagram (follow @tincanster on Instagram for some amazing videos). We wanted to get your thoughts on the DFW skate scene and Dallas’ future Bachman Lake skatepark. SP4D: First off, to learn about you--when did you get your first skateboard and how did you get interested in skateboarding? Marshall: I got my first board when I was 1 and a half, but I didn't get heavily interested til about 9. My dad skated and took me around with him when I was younger. SP4D: Who have been your biggest influences in skateboarding? SP4D: You are a well-rounded skater, able to do tricks on big transition ramps and consistently land tricks on the street courses. With so much of modern skateboarding moving toward street skating, what got you interested in mastering both styles? Marshall: When I first started out all I skated was transition. I went to Freestyle Skatepark every day after school until it closed. Once it closed, there were no skateparks anywhere near me for a year or so. I was forced to just skate flat ground and a flat bar. Once The Pier opened, I skated everything every day. SP4D: You won Guapo Skateboard’s King of Guapo skate contest last year, which gave you a free trip to the famous Tampa Am skate contest in Florida. What was the Tampa Am like? Marshall: Tampa Am is a crazy place. There are people everywhere. Even if you pulled up to the park when it opened up, there's already a plethora of people inside. You can tell everyone there wants to win, but have fun as well, which does ease some of the pressure. SP4D: What new ideas about your skating and Dallas skateboarding did you come away with? Marshall: It got me much more interested in skating transition, and just showed me how many people out there skate. SP4D: California is world-renowned as the mecca of skateboarding. Any thoughts on how we can make our local Dallas skate scene better? What do you wish people knew about the local scene? Marshall: It is the mecca of skateboarding because its “simpler” to skate spots and other places. In Dallas, you get a couple of tries and then are either written a ticket or kicked out of the spot. I just wish skateboarding was not viewed the way it was by people who do not skate. The stereotypes toward people who skate are all pretty negative. If those were able to be changed in any way (to be more positive), then maybe the scene would improve. SP4D: What are your favorite skate parks in the DFW metroplex and why? Vandergriff skate park because it is my home park. Guapo has an amazing bowl (watch him skate it at the link), the people who skate and run the park are cool and always positive. It is an indoor park which is always nice and it has a fun street section. Lewisville is fun mainly because of the mini ramp. I grew up skating a spine ramp or “W” ramp as a kid. Plus there are bump to rails and smaller handrails which help you learn tricks. McKinney is cool because it has lots of flow. You can cruise the whole park without pushing once and hit a lot of different obstacles. Its fun to skate this park with friends and run “trains” which is when we just follow each other and do tricks on the same obstacles. SP4D: The City of Dallas has earmarked several million dollars to build a modern, concrete skatepark at Bachman Lake. Being one of the leaders in skateboarding in 2018, what features would you like to see in the new Dallas park? Marshall: A bump to rail or an A frame. You can learn so many tricks on those types of obstacles. A bowl would be nice too. SP4D: What are your goals for skating going forward? Marshall: I just skate to have fun. If you are too goal-oriented, it takes out the fun. I just go with the flow and see what happens. SP4D: Do you plan a return to Tampa Am or enter any other contests in 2018? Marshall: I don’t know about Tampa again, it was a fun contest, but it is really hectic. I’d like to enter some local mini ramp or bowl contest, if any occur. SP4D: Thanks to Marshall for taking the time to speak with us, and for sharing his amazing skate abilities on Instagram and at parks all around DFW. For more of his skating, check out his Instagram. Join the Skateparks for Dallas email list to get the latest news on the Dallas skate park project and skate scene. We will be featuring more articles about members of the community, and welcome your ideas for who we should cover. SwitchLife.org is a non-profit that teaches kids life skills through skateboarding. This free program is run by Josh & Sarah Hurley, through donations of equipment and time.